Have you recently heard these words from the mouths of your darling cherubs? How do they make you feel: Snarky? Bristly? Helpless? Despairing? Volatile? It’s February, people – that magical time of year where we dig in to wait out the last six weeks of winter with people who proclaim the negativity of idleness in increasingly high-pitched voices and decreasing attention spans. With each cold-weather winter comes the likelihood of snow days and empty weekends, when all out-of-home activities and opportunities for running away travel are stolen by sub-freezing temperatures and blinding snowstorms. And sometimes the weather people get the forecast wrong and everything you’ve planned on has been cancelled though barely a dusting occurred. If you’re anything like me, you like to take these weeks by the horns and actively deal with the many, many difficulties that surface when everyone is home at once by hiding creating lots of fun activities to do. 1. Make them do laundry. Some people wear excessive amounts of clothing. They all live in my house. Are you kidding about these five pairs of jeans? I just did laundry yesterday! 2. Give everyone haircuts. A day at home is the perfect time to practice your hairstyling skills! Who cares if you find that your talents aren’t what they used to be: winter time is hat-wearing time. When you’re finished, just throw the clippings out into the snow – your front yard snowman will be the only one in the neighborhood with real hair. 3. Have a cooking lesson. Show them how to make lasagna, beef stroganoff, chicken soup, ANYTHING – and Boom – dinnertime. Note the wine in the background. Always have wine on hand for snow days. 5. Write thank-you notes. You know you neglect to do this regularly. Christmas presents, birthday presents, the random gift a friend sends you just for being awesome – you received, and failed to thank. You are a terrible person. Give your kids some pens and a few blank cards and voilà! Instant gratitude. 6. Paint something. I’m not a crafty person in general, but I do like art, so sometimes I encourage my kids to get out the leftover gallons of paint we have lying around and make something cool and interesting. That is, after they’ve touched up all the dings, weird scuffs and black marks that we have all over our walls. 7. Organize an eating contest. Add to your extra winter layer – you know you have one – by holding a family competitive eating challenge. You don’t have to have huge supplies of chicken wings or hot dogs on hand. Go through the kitchen and collect all the half-boxes of cereal, potato chips and crackers that that are still hanging around even though only crumbs are left, jars of pickles that no one likes, and that jalapeño jelly that you bought on a whim but will never use. Lay everything out on the table, set a timer, and the last to keep it all down is the winner. Guess what else? You just cleaned out your pantry and fridge. Internet high five! 8. Hand them some rags and instruct them to scrub something. I know: I use cleaning as my go-to solution for everything. But the hard truth is that all people are horrible slobs and, for the love of all things holy and moly, more than one person per household should be responsible for making things right again. BONUS: Everybody hates to clean, so they will do it as fast as possible and then go outside to escape any more of your weirdo snow day plans, leaving you to sip coffee while you watch Netflix all by yourself. *I'm kidding, obvs. Do not really give your children real tattoos, for real. For Pete's sake. I can't believe I feel the need to say this. Prompt #5: List 8 solutions for bored children. You need to save that last picture of him for his future spouse. And my favorite thing about summer? Less laundry. I think stuff falls off the hangers and they just put it in the laundry. All those heavy clothes. I'm convinced they destroyed my washing machine. It's a shame that the kids are away at school all day long... if they were home cleaning up it would make my job a hundred times easier. My goal as a mother is to teach people to clean up after themselves so that I don't have to anymore. I often follow up "I'm bored" with "You are? I never am!" and list all the reasons why. 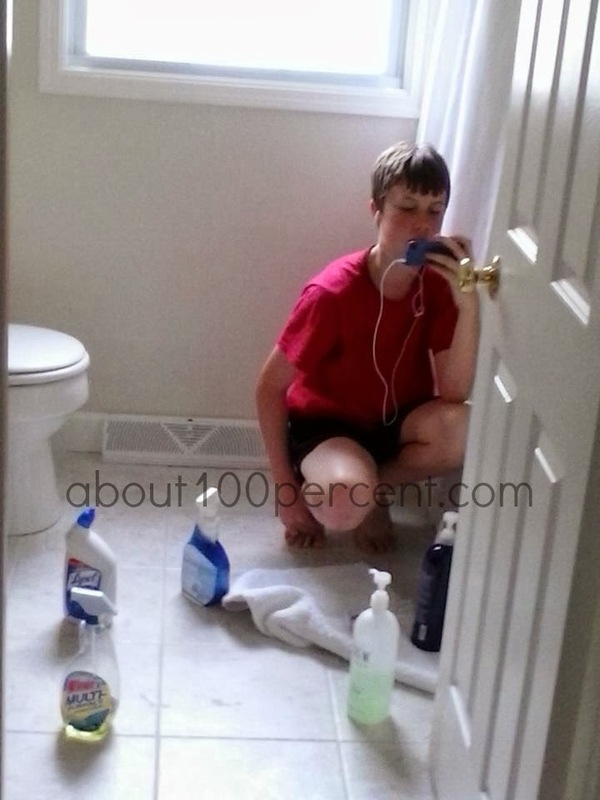 Then I hand out chore lists and hide in the bathroom. You can shout about laundry. It's really okay. Personally, I like to shout about WHY NOBODY AROUND HERE CAN PUT THEIR OWN STUFF AWAY, but that's just me. I should confess that shortly after this picture was taken, we banned personal tunes while cleaning. Or watching movies on our Kindles/iPads while cleaning. It simply wasn't getting the job done. Yes! What is it about cold weather that makes us want to gorge ourselves? I gave all my children real tattoos before I read the fine print. CRAP! Laughing about the tattoos. I wonder if you can jade your kid with tattoos and they will not get them or will it stoke the fire. I get cracked up when I see a woman my age with tattoos. You can't go back in time babe is all I think. My favorite is the 60 something woman with a walker who has a huge blue dagger on a leg where I do water aerobics. As you can tell, I am that oldish broad who is not a fan of tattoos. I understand why someone wants one; just don't think they should. I got a tattoo when I was nineteen. My mission in life is to tell all children I see not to ever get a tattoo, especially not when they're nineteen. Tattoos! I don't think there's any danger of my son wanting a tattoo--he hates needles as much as I do! Mine do too, and I do hope and pray that they keep up this fear. All I know is that I'm happy you drink wine from a box, too. And I want to have a jalapeno jelly eating contest. Wine from a box is always a good idea. And jalapeno jelly is good when smeared over a brick of cream cheese. It's a classy pairing. LOL! I love this list! We don't get much awful weather here, although it does get a bit too sweltering in the summer to leave the comforts of AC. I particularly like the idea of writing thank-you notes. Good times! Thank you! Yes, thank-you notes. I am the worst at this. The WORST. My Mom used to use that one - "I'm never bored and here's why." She also used to tell us that only boring people are bored. We learned not to say that around her. I had to laugh because on snow days my Mom always had chores in mind. She still does it! I love saying that line, but I think I will keep "only boring people are bored" in my arsenal as well. This made me giggle - thank you! I live for telling my kids classic Mom lines. Cleaning is a good idea. All the time. It's a year round activity that needs to be practiced. Boxed wine is only a little awkward.